Ok, most people who know me know I love the fall. It's my absolute favorite time of the year. I enjoy decorating for the fall, I love the weather, and the colors of fall. Not that we have "real color" here in Texas but a few trees leaves change to yellow and occasionally even a tinge of orange. Most of all I think I love fall because my son was born in the fall. He was actually born the day before Thanksgiving. So, it's always been a time of celebration in our home. I'll never forget when he was about 10 and we were at a store shortly after Halloween and of course there were nothing but Christmas decorations everywhere. He looked at me and said, "what happened to Thanksgiving?" That's how I feel! Not that I don't think Christmas is important because it is but Thanksgiving...well, if it wasn't for those people coming to America in search of religious freedom who knows what our lives would be like? Ok, sorry for the little rant but you have to admit everyone overlooks Thanksgiving! When I saw the Holiday mini, I knew I had to have this set. First off, it kind of looks like my hearth and mantle in November! Secondly, I love the saying, "Happy Thanksgiving, Happy Fall, Happy Blessings, to one and all." Wow, that just sums it up! So shortly after I mounted this set, I started to work on my first creation. It's a cut out card and it wasn't easy but I do love the way it turned out. 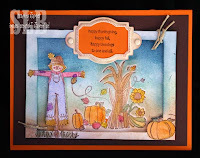 I just love all the colors, the pumpkins, the sunflowers, and of course the adorable scarecrow! All products from Stampin' Up! Happy Fall everyone...it will be here soon...it has to be! Pretty as a picture!! I would hang it on the wall or put it on a stand! Love this set & your card! I love this card and can't wait to get that set!